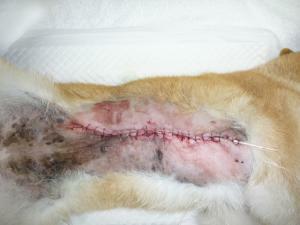 Outcome following treatment of soft tissue and visceral extraskeletal osteosarcoma in 33 dogs: 2008-2013. Extraskeletal osteosarcomas in dogs: 14 cases. J Am Anim Hosp Assoc. 1998 Jan-Feb;34(1):26-30. 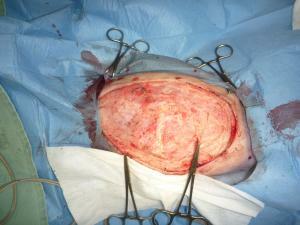 Fourteen dogs (11 females, three males) with extraskeletal osteosarcomas (EsOSAs) were identified. The median age was 11.5 years. The median body weight was 18 kg. The primary sites of the EsOSAs were the spleen (n=6), mammary gland (n=3), lung (n=2), and one each in the skin, axilla, and mesenteric root. The overall median survival time was 74 days. The only factor which was found to be prognostic for survival was the use of chemotherapy (p of 0.02). Cases which did not have chemotherapy were 3.62 times as likely to die a tumor-related death than cases which had chemotherapy.